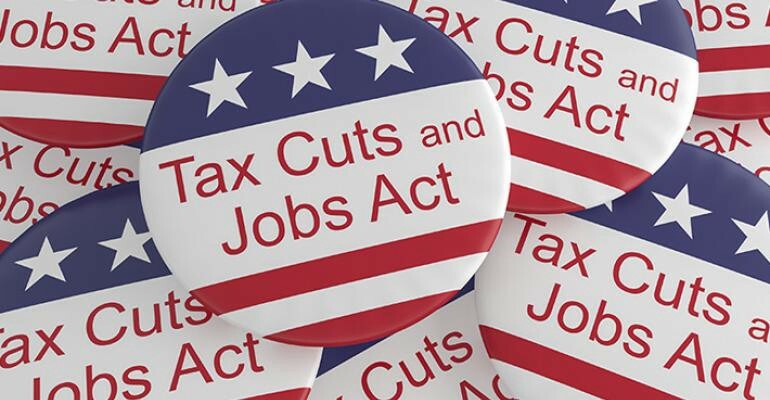 This year, there has been much debate on the impact that the Republican tax bill (the Tax Cut and Jobs Act) will have on the American public, especially when it comes to the middle class. Supporters point to the fact that there has been a continued drop in the unemployment rate, and most people seeing more money in the paychecks as signs that the bill is having its intended effects. Opponents of the bill have been hard at work countering this argument by branding the bill as a tax cut for the wealthy. Some Republicans appear to be jumping ship on the bill, including Senator Rubio criticizing the bill’s ability to create the advertised economic change. And while Rubio’s support may have changed (at least publicly), opinions of the bill among Americans have not shown significant changes since our last national survey and analysis of the tax bill in February. Our latest national survey shows total current support for the bill at 48%, while 31% oppose the bill, and 21% are unsure about how they feel. Support for the bill is relatively evenly distributed among age, gender, and education. Not shockingly, however, partisanship is one of the few groups that show different views. Indeed, Republicans are overwhelmingly favorable of the bill (77%), while half (46%) of Independent voters support the bill, and only 23% of Democrats support it. Another differentiation is across different ethnicities. 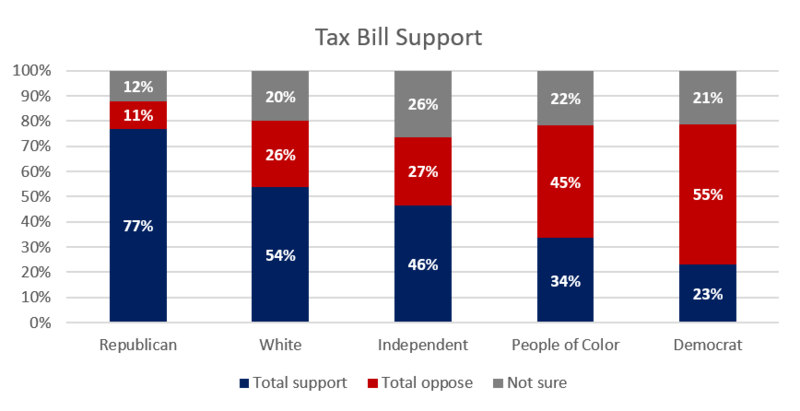 While over half (54%) of white voters support the tax bill, far fewer (34%) people of color share this view. Although the bill has the most support from Republican and white voters, these are not the demographics who are expecting to be impacted by this legislation. Fewer whites (35%) expect to be impacted by the legislation, while almost half of people of color (45%) expect to be impacted. And, among the 77% of Republican that support the bill, only about half (49%) believe they will be personally impacted. In comparison, whereas 46% of Independent voters support the bill, only 37% believe they will be impacted. And, although Democrats are the biggest critics of the bill (only 23% support), almost a third (31%) believe they will personally see an impact. The difference between bill supporters and those who believe they will feel an impact follows trends we have noted from our past national surveys and likely tells us something about the strength of the messaging from the Republican party around the bill. Republican and Independent voters do not need to personally experience an impact from the bill to support it. So, how do Democrats message this bill going into the 2018 elections? In our latest national survey of likely voters, we tested a few messages about the tax bill to gauge how voters responded. 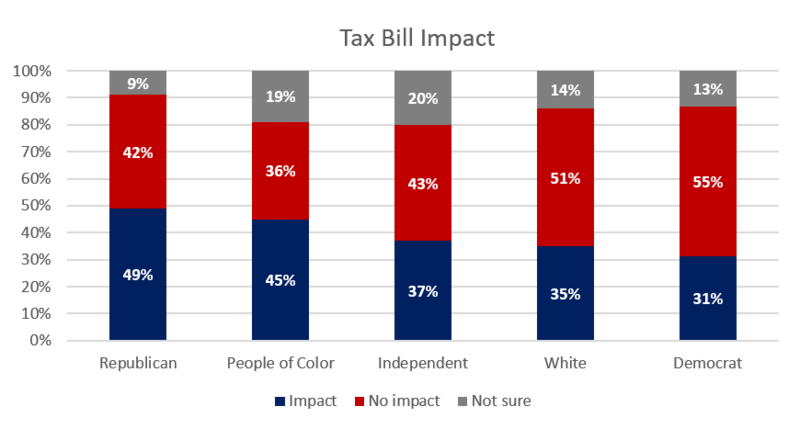 We chose both positive and negative characteristics that had been discussed with the tax bill and asked voters which impacts will happen or have happened because of the tax cuts. 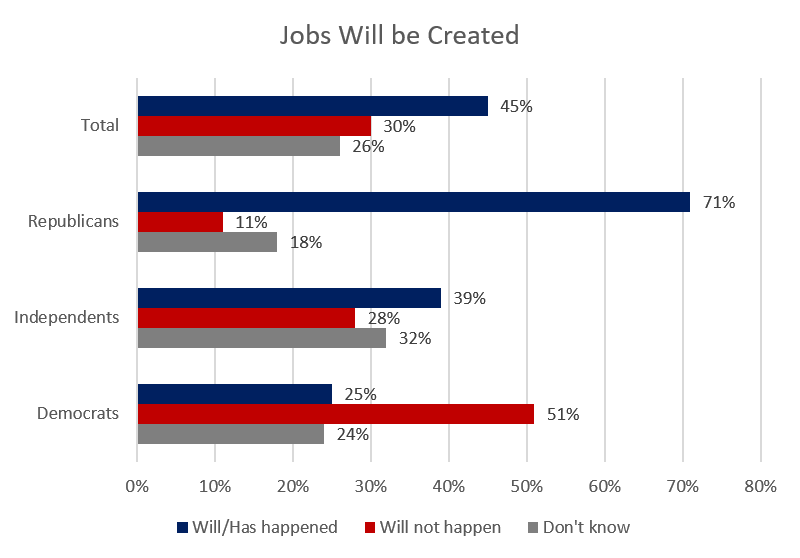 First, we asked whether voters thought the bill had or would create jobs. As the Republicans have worked hard to present the bill as a way to create jobs for the middle class, not surprisingly, almost half of total voters (45%) believe the bill would or has created jobs. In contrast to Republicans who believe this most strongly, only 25% of Democrats think the bill will create jobs and over half (51%) of Democrats do not think that jobs will be created because of the bill. When talking about the tax cut, Democrats have emphasized the message that this is a cut for the rich that will exacerbate income inequality. Despite the attempt to market the bill as an inequality bill, only a slight majority (53%) of Democrats think that the tax bill will or has actually increased income inequality. 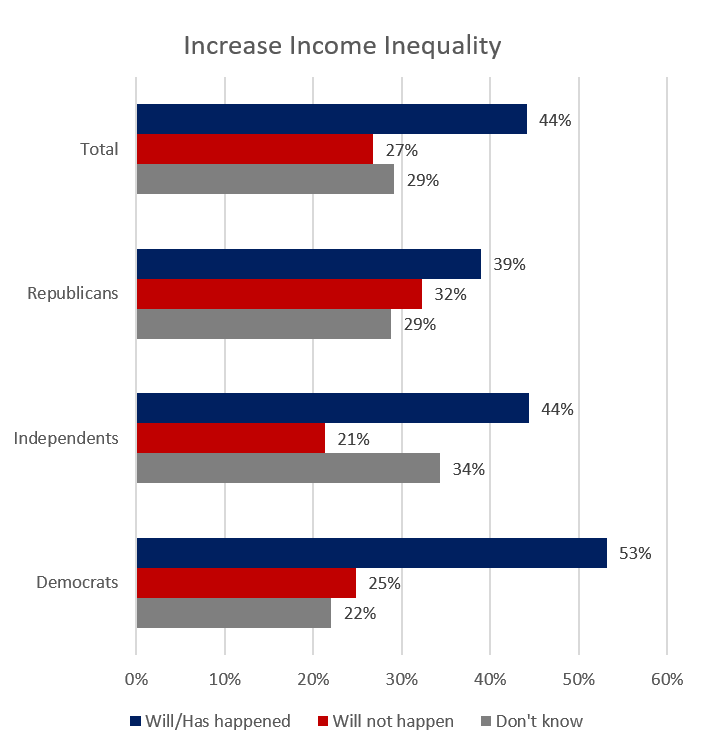 Additionally, less than half (45%) of Independents think the bill has increased income inequality and Republicans remain relatively split on the issue. While this has been the point of resistance on the bill from Democrats, it is clear that the message has not resonated with the Democratic base as strongly as the Republicans message on job growth has resonated with the Republican base. With only about half of Democrats agreeing that this is a bill for the rich, it is clear that Democrats need to find a new critique of the bill if they want to pull more voters over to their viewpoint. 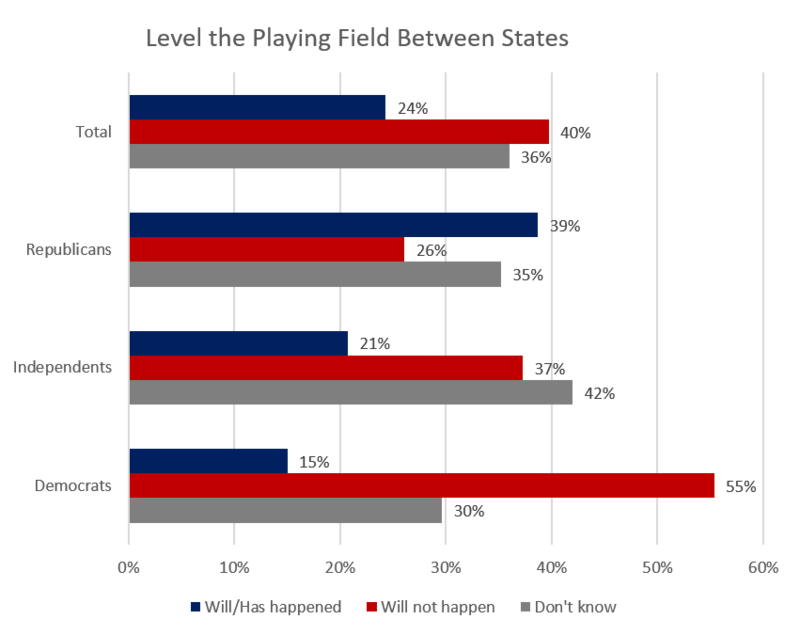 Of all the outcomes we tested, Democrats feel most strongly that the bill will not level the playing field between states. Since “state equality” is a Republican talking point, it is not surprising that Democrats are not on board. And while Republicans are the most likely to agree that this outcome is likely, it is not a strongly held opinion. A majority (55%) of Democrats and 37% of Independents agree that the bill will not cause equality among the states. Additionally, 30% of Democrats and 42% of Independents were unsure of how the bill would impact the states. These numbers point to the fact that the Democratic Party may be in a difficult position. It is hard to imagine Democrats rallying their base against the bill simply because it will not come through on the expectation that states will be on even ground, especially since this is a Republican talking point and not an outcome most Democratic states are interested in achieving. The lack of job creation appears to be a better foundation for Democrats, however they are going to have to deal with the fact that the unemployment numbers have dropped since January 1st and while there are plenty of economic arguments for correlation not equaling causation, we generally don’t see theoretical economics as the best bet for a winning message. What is not clear, based on the data we have available, is what the message should be going forward for Democrats. Further complicating the road ahead for Democrats is that views on the tax bill cut across the preferred outcome of the 2018 elections. 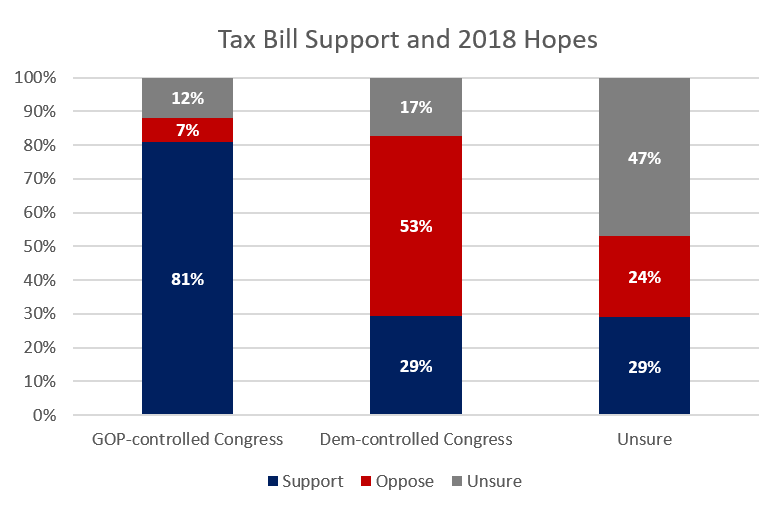 As we have discussed, support for the bill is very divided by party line and looking towards 2018, that does not change completely — 53% of voters who oppose the tax bill want a Democratic-controlled Congress and 81% of voters who support the bill want a Republican-controlled Congress. However, more than a quarter (29%) of those who want Democrats in control of Congress support the bill. Among those who are unsure about their congressional leadership preference, 29% support the bill and 24% oppose the bill. Arguably, Democrats can, and should win the quarter that oppose the bill, but they could just as easily lose the 29% who support it. If Democrats can come up with a message around the tax bill that resonates, there are still voters who are unsure about the bill and unsure about leadership in 2018 who are waiting to be convinced. However, the angle of opposition must be reformulated to convince these Americans that the bill is not working, and that they want Democrats in charge of Congress.